Dr. John Thomas was raised in Winter Haven Florida. He attended Brevard College, Brevard NC where he was a member of the Brevard College Baseball Team, before transferring to Barry University in Miami, FL where he earned a B.S. in Biology with a minor in Chemistry and was the School Mascot. He attended the Arizona School of Podiatric Medicine at Midwestern University in Glendale, AZ. 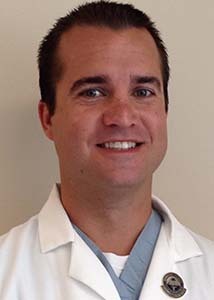 He attended a 3 year rearfoot certified residency at the Miami VA, Miami, FL He specializes in Sports Medicine, Bunions, Hammertoes, Diabetic Foot Care, Ingrown Toenails, Warts, Heel Pain, and Ankle Pain.